What does “K+M+B 2016” mean in when written on a church wall? 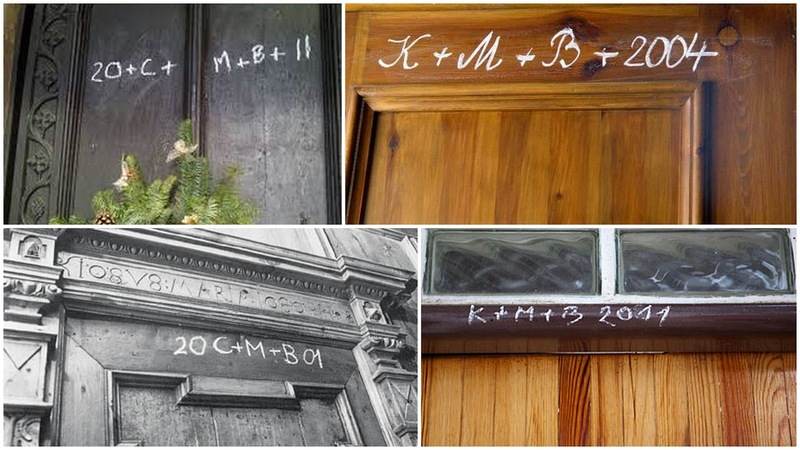 I was recently in Prague, and while visiting churches I saw several times the inscription "K+M+B 2016" (sometimes with a C instead of K) written in chalk on a wall or a door. I only saw this in (Christian) churches so I assume this has some religious meaning. What does it mean? It looks like it is a yearly thing, renewing the old one when the new one is up. In the church I read about it was done as part of the Epiphany Mass. It is a blessing to the house. 20 and 15 being the year, C (K), M, B being the initials of the traditional names of the wise men, Caspar, Melchior and Balthasar, they can also stand for Christus Mansionem Benedicat, the Latin words meaning, May Christ bless this home. I found that on this site which explains more about the custom. And here is an other site, with an other year. As you can see from the sites I linked to, it is not restricted to Czech republic, one of them clearly about a church in the UK while the other is about seeing the letters and numbers on the walls in Germany. In the comments it is mentioned that it is common in Czech republic and in several German speaking areas, and that it is often done by (young) children, as part of the Epiphany traditions. That is the feast celebrating the coming of the three wise men to Jesus soon after birth, the day of the celebration is January 6th (in the Roman Catholic church at least, and in the churches split off from it.) And hardly known these days, it also used to be called the 12th day of Christmas and was the end of the holiday season. It is a christian tradition also of Austria and South Tyrol (where I live in, which is a province of northern Italy near the Austrian border, and which was Austrian territory before WWI). Usually kids roam the streets (especially in little towns or villages) during the Christmas period and ring the doorbells asking for some offerings (usually for their first communion ceremony party, but also to help their parish or the poors in their community). If let in they may also sing Christmas songs. Anyway they leave that marking in white chalk on the door of the households they visit as a blessing and in memory of the three wise men (Kaspar, Melchior and Balthazar). In that passage there is also written that sometimes it is the priest himself that writes that on the doors as a blessing when visiting the households (in my experience this is seldom done in bigger towns, where the kids are the ones who make that writing most of the times). This Google Search shows many similar images. Sulle lettere in sè, C+M+B, ci sono due interpretazioni, entrambi plausibili: per qualcuno è la semplice abbreviazione di "Christus Mansionem Benedicat", cioè "Cristo benedica questa casa". Per altri è invece l'abbreviazione di Caspar, Melchior, Balthasar, cioè dei nomi dei tre Re Magi. As for the letters themselves, C+M+B, there are two interpretations, both likely: for someone it's the plain abbreviation of "Christus Mansionem Benedicat", that is "May Christ bless this house". For other people it's the abbreviation of Caspar, Melchior, Balthasar, i.e. of the names of the three Wise Men. Many people think that it stands for the names of the 3 wise men (Caspar, Melchior and Balthasar), but i was told it stands for „Christus mansionem benedicat“ („Christus segne (dieses) Haus!“). Not sure which is true. In Czech Republic, it's signature of the Three wise men (literally Three kings in Czech), Kašpar, Melichar and Baltazar. Some children (probably from observing families) still go caroling on the 6th of January. But mostly the initials are just a custom devoid of any religious meaning, something the small children do in pre-schools during art sessions, together with creating paper crowns for costumes. It means Christus mansionem benedicat (May Christ bless this home) but it's commonly misunderstood as three kings initals and that's why you can see all those K+M+B instead of C+M+B. Keep in mind it's a mistake. These are not initals despite most of people believing so. What's important to remember is that those '+' signs are not pluses, this is not a mathematical equation, although one may find places with K+M+B=2016 (sic!). Those '+' represent crosses. So the most correct form is C†M†B 2016. There's an old tradition of blessing chalk in Catholic Church on 6th January. After Christmas priests start visiting houses and blessing households. Depending on region it all takes place, priest is writing 'C†M†B 2016' on the house's door or households are waiting for him with that symbol already written. In the bible, among the first people to see the newborn Jesus, there were three foreign scholars/kings/...?, commonly called Caspar, Melchior and Balthasar. Before Jesus was born, they heard a propecy about him, startet to travel to see him, and were led to the place were he was born by a moving star (see the 4. person in LectorHectors answer, symbolizing the star). They also brought presents: (among other things?) there were gold, incense and myrrhe (all three pretty valuable back then). Today, eg. 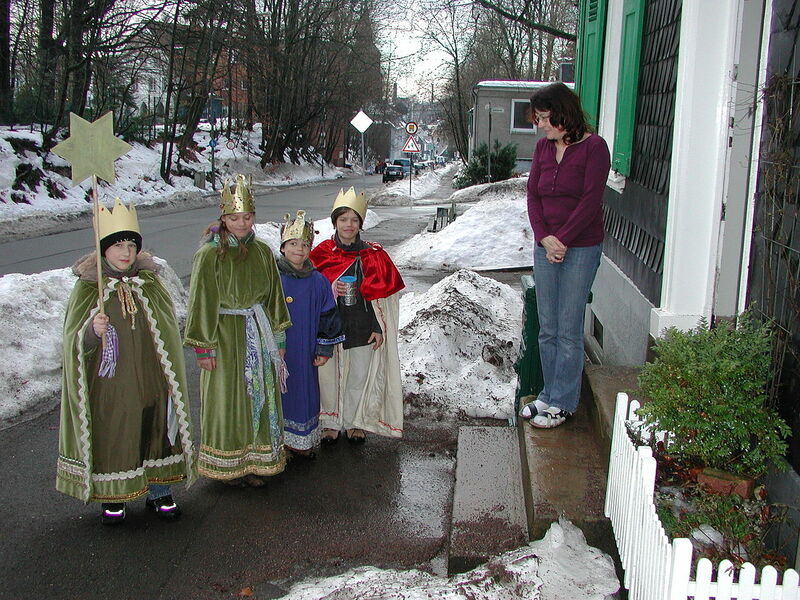 in Austria, groups of children "travel" around on 06.01., usually organized by the local priest, and often with king costumes. That they sing christmas songs, write on house doors (if the owner allows it) etc. is sufficiently covered by others, but some of them even now give out incense for home usage. Nowadays, the whole action of course is connected with charity; many people donate money (where it goes depends on the location). (And the children usually get quite a few sweets too). May Christ bless this home. It's not only written on churches, but on every house's door (for those who want it). It is a coincidence that Caspar Melchior and Balthasar have the same initials. I don't have a written source, our local priest told me so, and we learned that at school (Germany). I also have never seen K+M+B, but obviously this version exists as well. The custom of chalking the doors yearly just after Christmas was explained to me as commemorative of the visitation by the 3 wise men who sought him assiduously were guided by the heavenly light to his place at the manger -- that we who dwell in places with doors should remember that such places were denied to Mary when she and Joseph sought accommodations at an inn -- that we would do wisely to ask the Lord's blessings upon our doors -- which were symbolic of the shelter to which they regulated access -- the blessing was addressed directly to the door -- from Psalm 121.8: May the Lord keep thy going in and thy going out; from henceforth now and for ever. Not the answer you're looking for? Browse other questions tagged religion czech-republic prague or ask your own question. What does “OCBC Skyway” stand for?